Over the last year… I’ve asked many of you why you do what you do. It is my turn to answer that question and to share something very personal with you. Remember the following video? I started doing websites in 1996. I was recently laid off and wasn’t sure what to do next. I have always been very technical and very creative. So I launched out on my own with one simple desire. Be the one people could count on to succeed online. Over the years, I have worked with large and small clients… and I must confess… there is a soft-spot in my heart for the small business owner. Large companies have lots of money and lots of people to get things done. Us small guys are constantly working on all aspects of our businesses. Earlier this year, I made a no-looking back commitment to provide high-quality, reasonably priced mobile-friendly websites and strategic content marketing services to the small business owner. You guys deserve a break. ShoesOptional is honored to be of service. YOU are WHY I do what I do and WHY ShoesOptional does what WE do! For 2015, we are already creating some great mobile-friendly websites, awesome optimized content and amazing ways to grow your presence online. 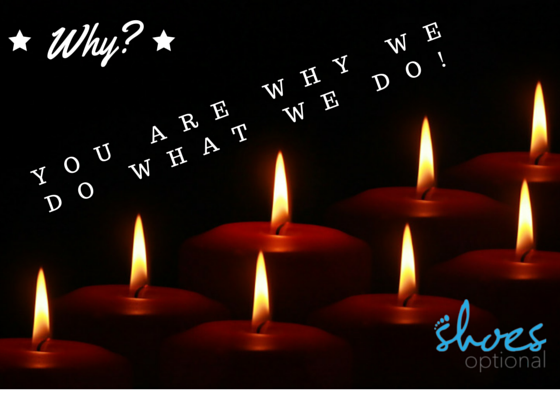 I am one of the small business owners that Jeff Baker contacted to ask for my why. I was deeply moved. I just finished the Kersey Sorter test, discovered I am “Idealist” and discover that mail chimp does the communication between website and customers. I want to stand up and say I know Jeff. I suspect many people know Jeff. Just a nod of the head to say I am not surprised that an organization with Integrity works with another company with Integrity.